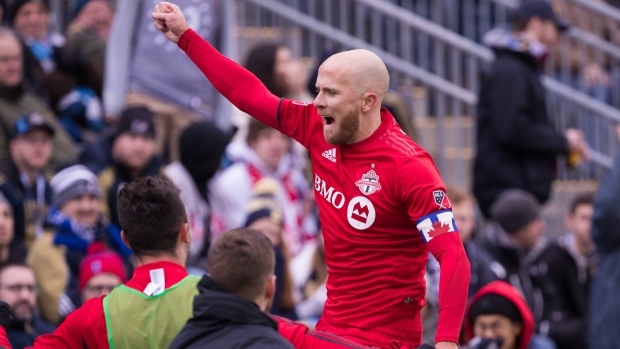 CHESTER, Pa. — Michael Bradley scored his first goal since the 2016 season and added another in the second half for his first career multi-goal MLS game as Toronto FC opened the season with a 3-1 victory over the Philadelphia Union on Saturday. Bradley, the eight-year MLS veteran who was scoreless in back-to-back 30-plus start seasons, scored the first goal of the 2019 season in first-half stoppage time with an easy redirection of Auro's cross to the penalty spot. His second goal in the 62nd minute also came on an open shot from the spot. "Outstanding. He covered a ton of ground, knows when to get forward and when to defend," said Toronto FC head coach Greg Vanney. "He was in the right spot at the right time on both occasions. A lot of times he ends up getting stuck deep, but with Marky (Delgado) now back he can release and get himself in goal scoring positions. It's not something we expect of him but he's fully capable." Nick DeLeon, an off-season acquisition from D.C. United, capped the scoring in second-half stoppage time with a shot from the top of the 18-yard box for his first goal since 2016. "(DeLeon) has been fantastic since he arrived. I can't think of a better guy he is all about the team," said Bradley. "Such a good way in terms of immersing himself to the team and on the field. A very good player who you can use in many ways. He is mobile, a good footballer and I can't say enough about him." Toronto had several other good scoring chances in the first half but Jonathan Osorio's penalty-kick attempt in the 34th minute was saved by Andre Blake and Jordan Hamilton's breakaway shot rolled just wide of the post. Toronto has a four-game winning streak in the series and its undefeated streak against the Union has reach four years with its last loss coming on September 6, 2014. Philadelphia ended a 359-minute scoreless stretch in the series on Marco Fabian's penalty kick goal in the 73rd. It was the MLS debut for the Mexican national team member. The Union nearly scored three minutes later but Toronto defenceman Laurent Ciman cleared it off the line.